Yesterday's rainstorms subsided and gave way to a beautiful morning. 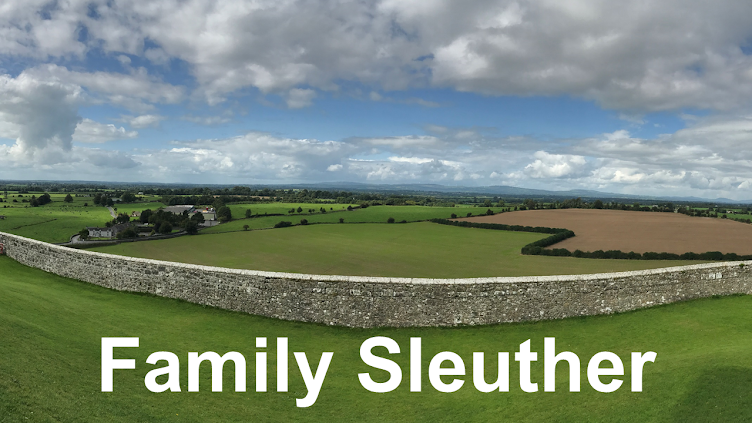 We were ambitious for day four of our family history journey with lots of ground to cover on the agenda. 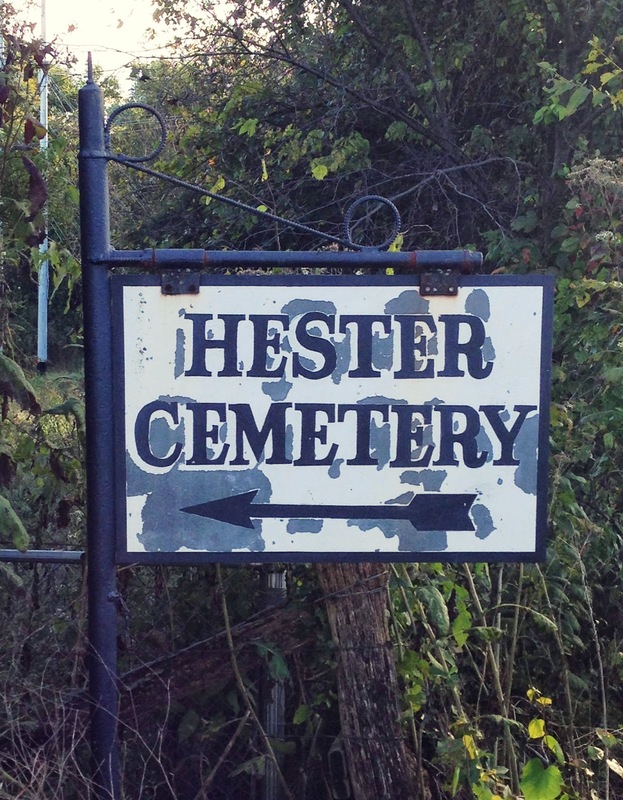 Our first stop was Hester Cemetery near Baldwin, Arkansas on the outskirts of Fayetteville. There's a small sign alongside a two-lane county highway pointing down a gravel road. Keep your eyes peeled, or you'll miss it! Wheel ruts have been carved deep into the dirt path. The tires of my rental car sank into these canyons while the molded lump of earth between the ruts dragged along the underneath of the car's frame. I worried that we would tear loose the vehicle's undercarriage. (Take note, family history road warriors, rent an SUV!) After a short distance, the road opened up into a small grassy parking lot in front of a gated cemetery that's well maintained. Hester cemetery is where my 2nd great-grandparents Wilburn Malley and Annie Charles (Winkler) Wagnon are buried. The Wagnons were dealt a traumatic blow when they lost their 15-year-old son Wayne in 1937. According to a newspaper account, Wayne was run over by a "loaded truck" at his parents' home when he tried to board it. "He lost his footing and fell under the machine, which was loaded with rock, with a wheel passing over his body." 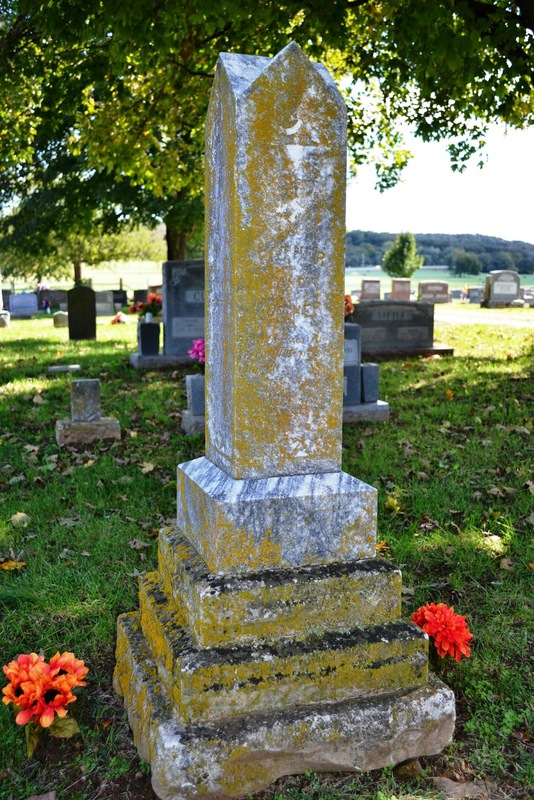 A homemade stone marker sits on his grave with his name scrawled into the monument's skyward-facing surface. Later in the road trip, an aunt shared with me a haunting photo of Annie visiting the grave of her son, laying flowers at the base of his headstone. Clearly, the heartache and loss was something she carried with her the rest of her life. Today, the stone's inscription is difficult to read. On either side of Wayne's grave are two small square-sized numeric markers embedded in the grass. To the left of Wayne is a stone marked 47 and to the right is one marked 49. These are the graves of Annie and Wilburn. Annie is buried in plot 47 and Wilburn is buried in plot 49. Our next scheduled stop was Neal Cemetery in Madison County, Arkansas. It's an old cemetery with the last burial more than 70 years ago. My 4th great-grandmother Elizabeth (Powell) Reeves was buried here in 1884. She was the wife of Jeremiah Turner Reeves, the War of 1812 ancestor whose grave we visited on day three. For unknown reasons they were buried in different cemeteries. Following directions from FindAGrave and ArkansasGraveStones.org, we searched for an unnamed dirt drive that turned off Highway 74. There were several. The GPS kept conking out as the cell signal was lost deep in the Arkansas hills. One of the drives was sealed with a gate. Another shot upward at an insurmountable incline for the rental car. 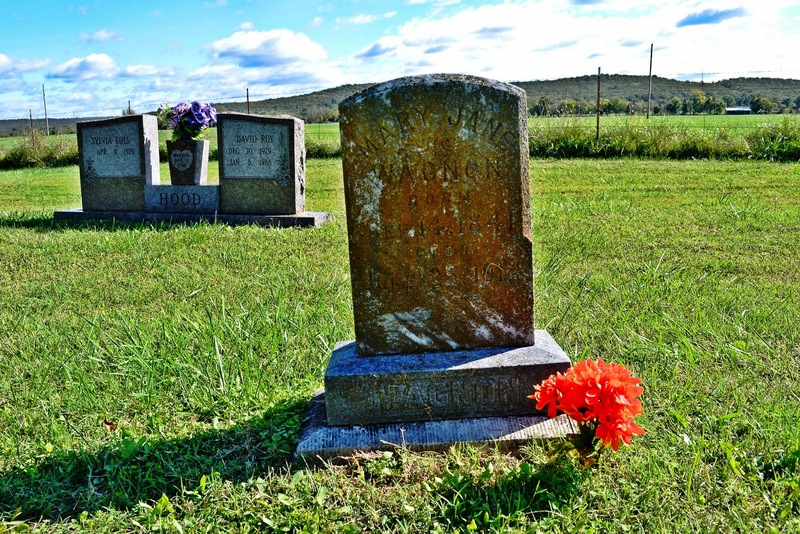 A third drive led to a private residence with no cemetery in sight. Back on Highway 74, I pulled off the pavement alongside a lush green pasture populated with a dozen calves. I stepped out of the car to see if I could catch a cell signal. The cows paused their grazing and cocked their heads left and then right, curiously eyeing me as I walked with my iPhone futilely trying to reactivate my GPS. Although we knew we were close, we were at a loss and our day didn't have time enough to accommodate continued search efforts. We decided that Great-Grandma Reeves would be the reason we would come back. And hopefully with better instructions! We left the hills behind us, and pulled into Strain Cemetery - the final resting place for my 3rd great-grandparents John and Mary Jane (Calfee) Wagnon (parents of the above-mentioned Wilburn). When Mary Jane pre-deceased John in 1914, he erected for her a modest-sized monument. Although there's no inscription on the stone or separate marker for John, his 1923 death certificate confirms that he was also buried in Strain. I believe he's buried beside his wife. The journey continued to Baptist Ford Cemetery in Greenland, Arkansas where my 3rd great-grandparents John Wesley and Martha (Bowen) Upton are buried. 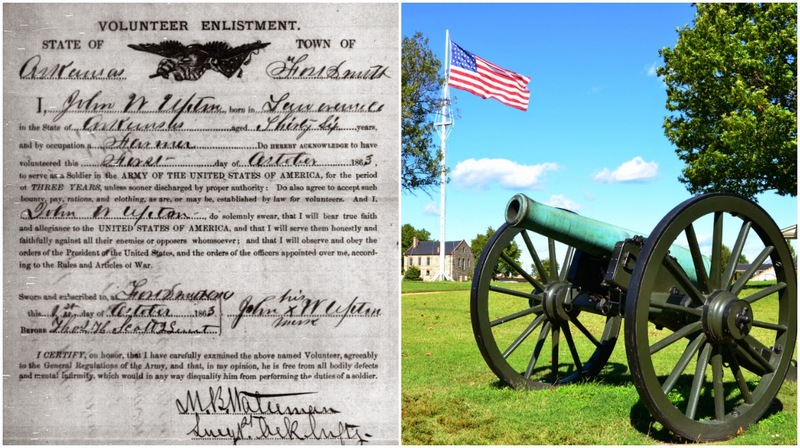 During the Civil War, John Upton served with Union forces, and readers of this blog will recall that I recently learned from his pension file that he was inoculated with "poison vaccine." It was difficult to locate their marker because the inscription was very faint. We discovered that someone had taken an abrasive tool to the surface of the stone to remove the obstructing moss. In the course of their efforts, they inadvertently scraped away portions of the inscription. I'm sure they meant well, but it's disheartening to see irreparable damage to stonework that's over a century old. I couldn't travel all of this way and not make the extra 60 miles south to Fort Smith National Historic Site. It was at Fort Smith that John W. Upton enlisted with the Union army on October 1, 1863 - more than 150 years ago. Although the soldiers' barracks from the Civil War era no longer exist, I wanted to set foot on the ground where John enlisted and where he received his tainted vaccination. It was a tremendous experience to wander an American historic site with an articulated link to my family's own history. Closing the day, we drove across the Arkansas River into Oklahoma - our road trip's fifth state. We spent the evening in Muskogee reconnecting with family that we hadn't seen in 21 years.